Thursday, July 20th, 2017 – Ritsumeikan University announced the opening of their College of Gastronomy Management along with their educational partnership with Le Cordon Bleu at a press conference held at Ritsumeikan’s Tokyo campus. In attendance was Le Cordon Bleu International’s Asia Representative Director, Charles Cointreau, Ritsumeikan’s President, Mikio Yoshida, and future dean of the college, Toshio Asakura. 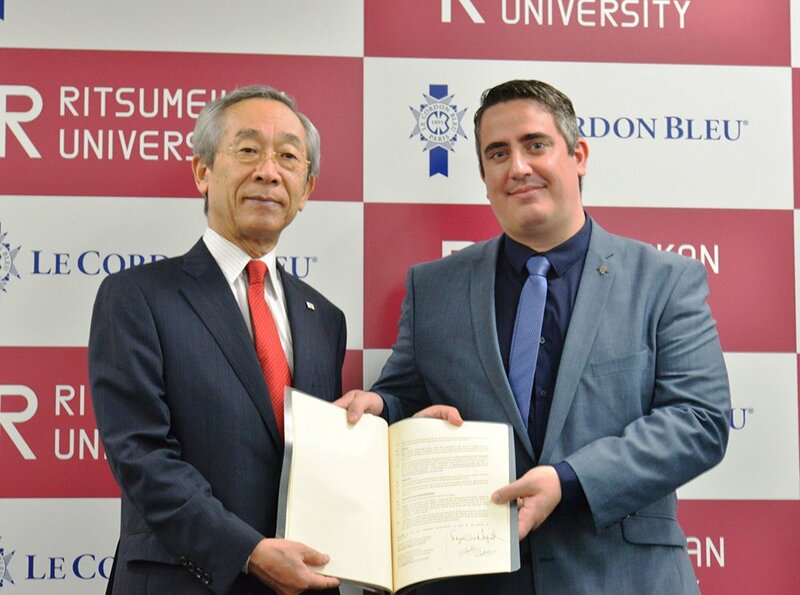 Le Cordon Bleu will be launching a Global Culinary Arts and Management Programme, its first major venture into higher education in Japan, with Ritsumeikan, a leading Japanese private university. 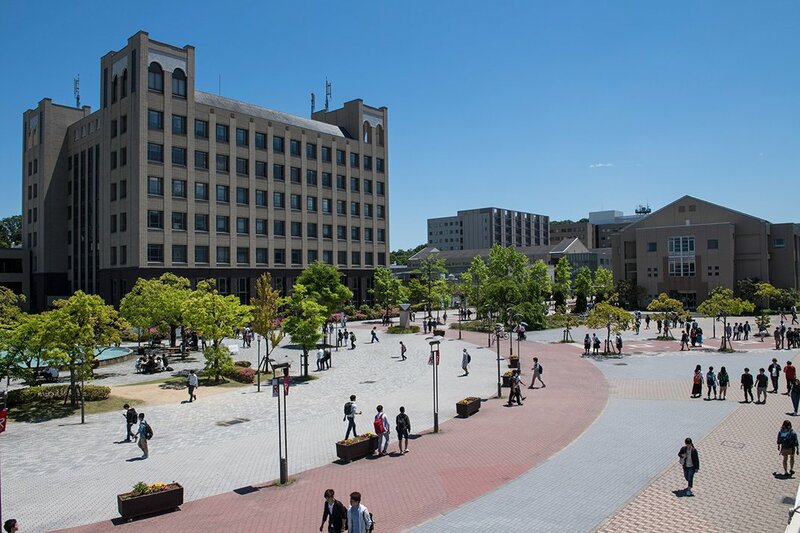 The new College of Gastronomy Management to open in April of 2018 is Ritsumeikan’s fifteenth college to date, and the Global Culinary Arts and Management Programme is intended for students of this college. The College of Gastronomy Management examines human and social food issues holistically, linking approaches from various academic disciplines to rear a new generation of leaders capable of tackling food problems that cannot be solved by conventional values and wisdom. Learning is centered around what is called “Gastronomy Science”, which derives its academic foundations from economics and business administration. Three areas of study then stem from these; they are management, culture, and technology. Through the field of food management, students will understand the supply and demand chains of our food systems, their organisations, and how locality, optimization for certain social contexts, sustainability, industry, and management can affect them.Learning about food and culture, students explore the cultural, geographical, and historical interactions between Japan and the greater world of food. Finally, in food and technology, students learn about ingredients, how they interact with our bodies, and various mechanisms connecting the two. Students enrolled in the College of Gastronomy Management taking the Global Culinary Arts and Management Programme will take a range of subjects from both Ritsumeikan and Le Cordon Bleu Japan. Among the subjects comprising their Bachelor of Gastronomy Management degree, students will take 12 specified Ritsumeikan subjects as well as 7 required subjects offered exclusively by Le Cordon Bleu Japan. When they meet the necessary requirements to graduate, students of the Global Culinary Arts and Management Programme will be awarded an Advanced Diploma of Culinary Arts and Management along with their Bachelor’s degree. The Ritsumeikan Academy is one of the private comprehensive educational institutions in Japan with rich history and tradition, and we celebrated the 150th anniversary of the founding of the Ritsumeikan private school and the 120th year of the establishment of the Academy in 2020. More details to come regarding this exciting collaboration – check out our other programmes in the meantime!